RUSH: Mr. Snerdley asked me what I thought of the major announcement by Vladimir Putin, the grand pooh-bah of Russia, and here is why the Official Program Observer wanted me to weigh in. Vladimir Putin (some pronounce it “Vlad-eh-mere”) is now bragging that his country and the KGB have “developed an intercontinental nuclear missile that can’t be stopped or shot down by any country’s defense system.” He’s bragging that his nukes are better than our nukes. They’re more powerful, they’re more destructive — and, unlike our nukes, Putin’s nukes can’t be stopped. It’s a cruise missile, “intercontinental ballistic rocket with ‘unlimited range…'” Now, that clearly isn’t true. There’s no such thing as “unlimited range,” because even Putin’s missile’s gonna run out of energy. Even Putin’s missile is gonna run out of fuel at some point. There’s no such thing as unlimited range. I think what this means is that Putin can aim it at any target and hit it. But there’s nothing with unlimited range. It “was one of several unveiled by the Russian leader in his state of the nation address in Moscow,” and they had graphs and charts and photos and other visual displays showing one of his missiles approaching the U.S. from a variety of different launch trajectories. It could go polar. It could go Antarctic polar. It could go east. It could go west. It could bounce. It could do any number of things. He was demonstrating that he could find a route to get his missile here, no matter how far the distance, and that we could not stop it. Interestingly, one of the… It’s the U.K. Sun, I’m sorry. Not the Daily Mail. The U.K. Sun describing this actually has a screenshot showing Florida as one of Putin’s targets: Tampa. 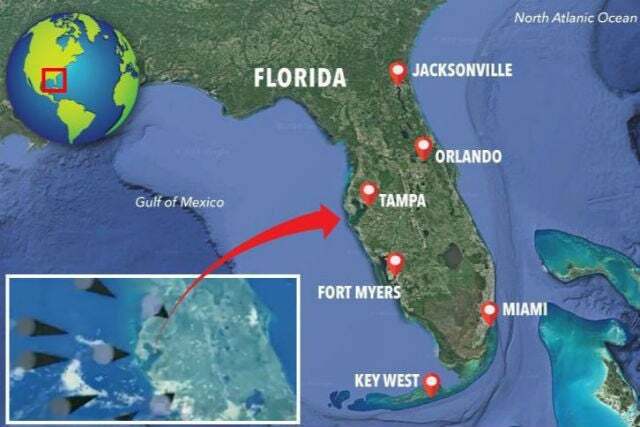 “Shocking CGI footage from one of the videos appeared to show Russian rockets targeting Florida, with Tampa Bay clearly visible,” with the launch being somewhere in Russia. “They include a nuclear-powered cruise missile, a nuclear-powered underwater drone and new hypersonic missile which apparently have no equivalent.” We don’t have, according to Putin, anything like this. “Footage shown during his speech apparently showed the new ‘unstoppable’ missile heading toward the United States as he promises to ‘neutralize’ America’s missile defense. ‘Russia remained a nuclear power but no one wanted to listen to us,’ Putin, 65, told lawmakers. Well, “listen to us now.” Putin’s new dream missile, the hypersonic ICBM is called the Avangard, capable of traveling 20 times the speed of sound and strike like a meteorite, like a fireball. Here are Putin’s most explosive claims from his speech. He’s raised fears of a nuclear arms race. He unveiled new hypersonic nuclear weapons which have no equal. The most frightening weapon he alluded to was a nuclear powered cruise missile that can travel 20 times the speed of sound, strike like a meteorite, calling it the Avangard. It has unlimited range, can’t be intercepted, can’t be shot down. Also announced a nuclear powered underwater drone and cruise missile. And he said that his weapons have no equivalent in the West. And he vowed to wage nuclear war on the United States if Trump attacked first. We’re not threatening anybody. We’re not gonna take anything from anybody. If you hit us, you’re done. That was his message. Still looking for the reaction to all this from Adam Schiff. Haven’t seen anything yet.